Home Attorneys and Staff George B. Autry, Jr.
George B. Autry, Jr. graduated from UNC School of Law and has been practicing eminent domain law in Raleigh, North Carolina since 1991. George has been chosen to serve as North Carolina’s only representative in the Owners’ Counsel of America, a group of attorneys (one from each state) recognized nationally as leaders in the practice of eminent domain. He also serves on the Owner’s Counsel of America Board of Directors. 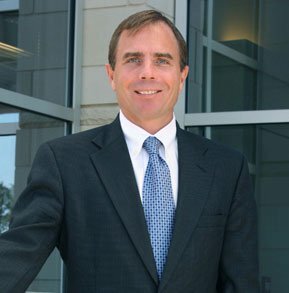 He was appointed Chairman of the Land Condemnation Specialty Committee by the North Carolina State Bar. George Autry recently completed his second six-year term on the North Carolina Mining Commission. Obtained a jury verdict of $2,533,364 including interest, for a Durham County hotel owner originally offered $291,000 for the taking of approximately .6 acres of land. Obtained a jury verdict of $2,558,031.12, including interest, for an Alamance County landowner originally offered $400,800 for a partial taking of his property. The verdict continues to be the largest of any kind in Alamance County history. Obtained a jury verdict of $1,707,033.16, including interest, on behalf of a Durham County restaurant owner who was originally offered $427,425. Achieved a settlement of $3,041,000 for a Wake county property owner originally offered $692,760 for a partial taking. Obtained a settlement of $3,667,000 on behalf of two brothers in a highly publicized case involving the total taking of a family tire business located in downtown Raleigh. Achieved a settlement of $1,277,266 on behalf of Rex Hospital for the taking of four acres. The hospital was originally offered nothing. George Autry has spoken and presented at programs at various eminent domain seminars and currently presents at area continuing legal education programs. Selected for inclusion in ”The Best Lawyers in America®,” 2007, 2008, 2009, 2010, 2011, 2012, 2013 and 2014 editions in the fields of Eminent Domain and Condemnation Law.